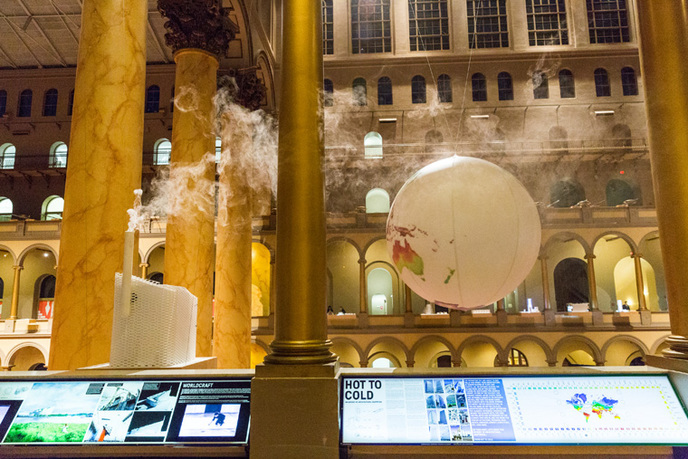 Hanging architectural models at the entrance to Hot to Cold at the National Building Museum, 2015, Washington, DC. Courtesy of Yassine El Mansouri and the National Building Museum. The Danish architect Bjarke Ingels is known internationally as the master of architectural fusion, combining seemingly irreconcilable functions, forms, and even entrenched ideologies to produce what he calls "pragmatic utopianism" and "hedonistic sustainability." 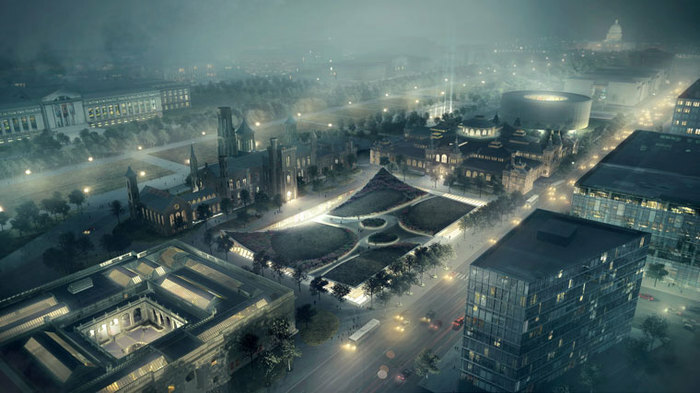 The result: a worldwide reputation, projects in eighteen countries, and, most recently, an assignment to create a master plan for the South Campus of the Smithsonian Institution along the National Mall in Washington. Hot to Cold: An Odyssey of Architectural Adaptation takes visitors from the hottest to the coldest parts of our planet and explores how BIG´s design solutions are shaped by their cultural and climatic contexts. Premiering twenty of the studio’s latest projects, interpreted through Iwan Baan's masterful photography of BIG's built work, the exhibition will present BIG's thought process—from the first sketch to the completed building—revealing their unorthodox approach, methods, and processes. More than sixty three-dimensional models will be suspended at the second-floor balconies of the Museum’s historic Great Hall in an unprecedented use of this public space. Bjarke Ingels started Bjarke Ingels Group (BIG) in 2005 after cofounding PLOT Architects in 2001 and working at the Office of Metropolitan Architecture in Rotterdam, Netherlands. Through a series of award-winning design projects and buildings, Ingels has developed a reputation for designing buildings that are as programmatically and technically innovative as they are cost- and resource-conscious. Ingels has received numerous awards and honors, including the Danish Crown Prince's Cultural Prize in 2011, the Golden Lion at the Venice Biennale in 2004, and the Urban Land Institute Award for Excellence in 2009. In 2011, the Wall Street Journal awarded him the Architectural Innovator of the Year award. Alongside his architectural practice, Ingels has taught at Harvard University, Yale University, Columbia University, and Rice University. Ingels holds degrees from the Royal Academy of Arts School of Architecture in Copenhagen and the Escola Tècnica Superior d'Arquitectura School of Architecture in Barcelona. 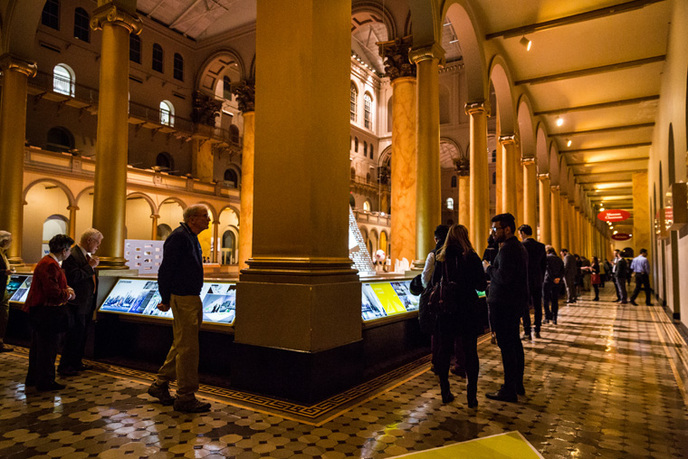 The exhibition is curated by Susan Piedmont-Palladino, a curator at the National Building Museum, an architect, and a professor of architecture at Virginia Tech's Washington-Alexandria Architecture Center. 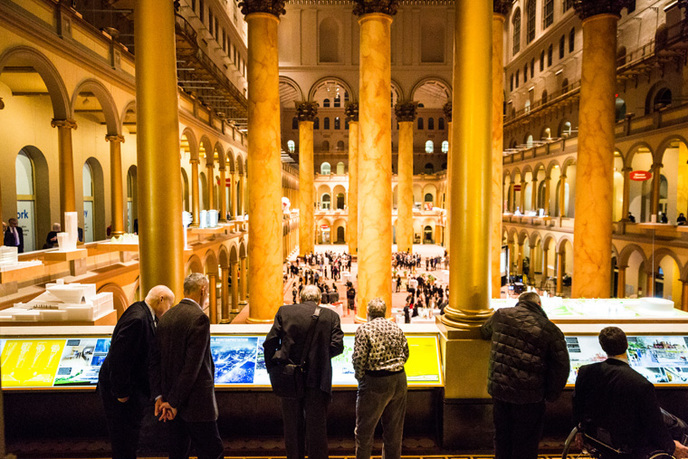 Her most recent project with the National Building Museum was the Intelligent Cities initiative, a multi-phase exploration of the intersection of information and communication technologies and cities. Her book Intelligent Cities was published in 2011. Exhibitions she has curated include Green Community and Tools of the Imagination: Drawing Tools and Technologies from the Eighteenth Century to the Present. Additionally, she was a consulting curator and writer for Big and Green: Toward Sustainable Architecture in the Twenty-First Century and Masonry Variations. A graduate of Virginia Tech and the College of William and Mary, Piedmont-Palladino writes and lectures regularly on sustainability, design education, and urbanism. Cathy Crane Frankel, vice president of exhibitions and collections, leads the curatorial team to develop the museum's exhibition program and coordinates the production of the museum's shows. Among those that she has directed during her tenure at the museum are the acclaimed House & Home; a series of ambitious exhibitions focusing on sustainability and the built environment; and history-based exhibitions such as House of Cars: Innovation and the Parking Garage and Eero Saarinen: Shaping the Future. Frankel has an MAT from the George Washington University and a BA from Dickinson College. BIG partner Kai-Uwe Bergmann brings his expertise to proposals around the globe, including work in Europe, Asia, North America, and the Middle East. Bergmann heads BIG's business development team, currently overseeing projects in fifteen different countries. Registered in the United States, United Kingdom, and Denmark, he is a LEED AP-certified architect who was project manager for Central Asia's first carbon neutral plan for Zira Island in Baku, Azerbaijan. Bergmann holds an MArch from the University of California and a BS in architecture from the University of Virginia. 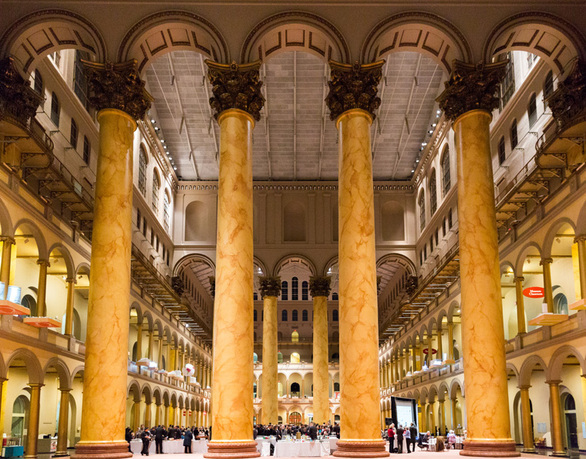 Established by an act of Congress in 1980, and opened in 1985, the National Building Museum is a private, nonprofit museum with a mission to advance the quality of the built environment by educating people about its impact on their lives.